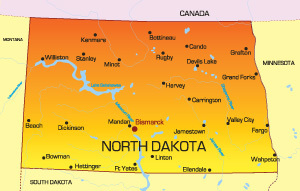 North Dakota is the 19th most extensive state in the United States and is also known as the Peace Garden State. The state has a population of 700,000 people and the capital city is Bismarck. The largest city is Fargo, which has a population of 100,000 people. The bordering states are South Dakota, Minnesota, and Montana. The major highways that service the state are I-29 and i-94. Notable universities in North Dakota include Jamestown College and North Dakota State University. Attractions that bring in tourism are the Empire Arts Center and the Fargo Theatre.